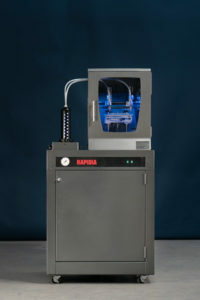 The Rapidia metal printer is similar to the standard FDM plastic filament printer. 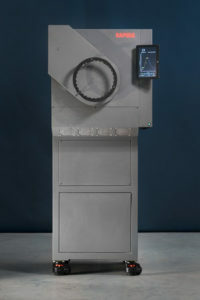 The two independent print heads are fed with a water-based metal, ceramic or support material paste. 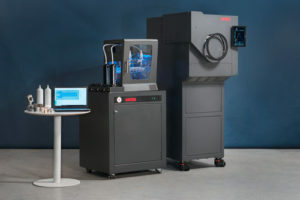 Water-based metal paste is the safest and most environmentally friendly method of handling materials for additive manufacturing as it allows a solvent-free AM workflow with no requirement for polymer disposal. No fumes or odors are created in the printer during printing, as the only material that evaporates is water. The printer uses an interface identical to a plastic filament FDM printer and runs on standard industry software. Like other open architectures, the user is not locked in and benefits from frequent and free updates. Download 3D Printer Data Specifications by clicking Rapidia-PRINTER-data-1. The Rapidia sintering furnace is fully automated, easy to install, safe, and user-friendly. It operates on 220-240 VAC single phase and plugs in to a standard NEMA 50A outlet, the same as any kitchen range. 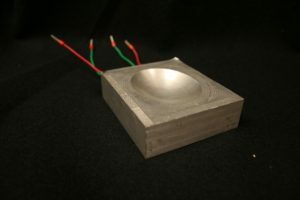 A retort made of thick refractory metal ensures thermal uniformity over the full temperature range. While the furnace may be connected directly to the internet for remote monitoring, the recommended interface is via the built-in USB port. This port is only required for remote diagnostic and software upgrades. All software required for the operation comes pre-loaded into the furnace. Besides sintering 3D printed parts, the furnace can be used for heat treatment, hydrogen brazing, bright annealing, and many other metalworking applications. Download Rapidia Furnace Data Specifications by clicking Rapidia-furnace-data-2. -Most office and environmentally friendly system on the market today. If you will be at Rapid+TCT 2019, visit Rapidia on Booth #533.